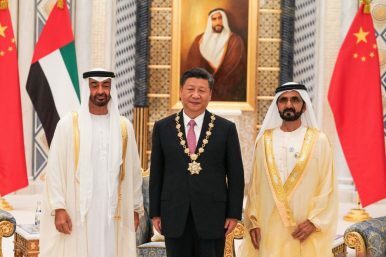 Xi Jinping receives the Order of Zayed during his visit to the UAE (July 20, 2018). China is making inroads into the Middle East — and being welcomed with open arms. As President Xi Jinping impels China to take a more active role internationally, the Middle East is becoming one of its key staging grounds. At a gathering of 21 Arab nations in Beijing this month, Xi pledged billions pledged billions in loans and financial aid to support economic development in these countries. At this Arab Summit, well attended by foreign ministers from across the Arab speaking world, the Chinese government successfully elevated their relationship with the region to a “strategic partnership.” Also signaling the increased status of the Middle East’s role in Xi’s global strategy was his just-concluded visit to the Arab region — his first foreign trip since his re-election last March, and the first visit to the UAE by a Chinese head of state in almost 30 years. Traditionally, China has looked to others – especially the United States – to act as the world’s policeman in political hot spots like the Middle East. But this is changing as China’s economic priorities are increasingly intertwined with its political interests. In announcing the visit, a Chinese Foreign Ministry spokesperson stated that this is part of “China’s major diplomatic move to target developing countries against the backdrop of profound changes in the context of the international situation.” As the United States and the European Union pressure China on trade and investment, China is looking elsewhere for opportunities. Effectively, China is launching a mini-Marshall Plan for the Middle East and North Africa. A key message conveyed by the China-Arab State Cooperation Forum is that China sees economic development as key to resolving many of the security and humanitarian issues in the region. And China seeks to be a world model for combining successful economic growth with an authoritarian regime – a model that holds some appeal in this part of the world. China and the Middle East have mutual interests and their economic relationship is expanding beyond oil, which Arab nations have long supplied to China. Chinese companies are actively pursuing major infrastructure projects in the Arab region as part of Xi’s Belt and Road initiative (BRI) – with many more to come as economies in the region recover after the Arab Spring. The Chinese institutions created to support the BRI are gearing up to provide financing for much-needed infrastructure. In Egypt alone, the Chinese have already pledged almost $50 billion to help support development of the new administrative capital. In the Middle East, demand is increasing for renewable energy, fintech, artificial intelligence, and electric cars – all sectors where China is playing a leading role. In fact, much of China’s financing will go toward supporting projects and sectors where China is a global leader. And the Arab region is welcoming it. In addition to loans and financial aid for economic development, it was announced at the Arab Summit that a new financial consortium will be created. Arab and Chinese banks will establish a fund of over $3 billion to support “economic reconstruction” and “industrial revival.” Key areas of focus will be promoting cooperation on oil and gas, nuclear, and clean energy. The details are still being worked out, but economic cooperation is much needed in the region – especially as the United States is more focused on “America First” and not providing the same level of support or leadership to the region as in years past. China is also using this financing – as well as access to its own market – to set key standards in the region. Take green finance, for instance. China is the global leader in this market, developing innovative models and definitions of green financing. China announced that it will “green” the Belt and Road: in order to receive financing, BRI projects must be in line with Chinese green lending standards. China is also establishing green pilot zones along BRI, which will require that those participating in the zone comply with Chinese standards on green development. While it is a positive model to use market mechanisms and markets for encouraging green development, it is also a subtle way of ensuring that the “Chinese way” is adopted in other countries. Significantly, at the Arab Summit Xi called upon the Arab countries to “press ahead” with negotiations for a free trade agreement (FTA) between China and the 21 Arab countries. Negotiation of this type of regional agreement is part of Xi’s larger strategy of wielding its economic clout to negotiate “free trade” agreements with key regions around the world. If this Arab-Chinese agreement is successful, China could grant special trading privileges along with financing to the Arab world, further strengthening ties — and thus political relations — with these potentially volatile governments. While it is no surprise that China’s political interests follow its global economic goals, it remains to be seen if its economic incentives result in the political ties that China seeks, particularly with the often fraught Middle East. For Xi, capturing the resource-rich Middle East is a core goal of the Belt and Road Initiative, so expect to see more developments in this new strategic partnership. Deborah Lehr serves as the Chief Executive Officer of Basilinna, a strategic business consulting firm focused on China and the Middle East. In addition, she is the Vice Chairman of the Paulson Institute, a think tank founded by former Treasury Secretary Hank Paulson located at the University of Chicago.